The name H. Carter Leak III is synonymous with Bank of St. Francisville. Carter drove the process that launched the bank in October 1978, writing to the Federal Deposit Insurance Corporation (FDIC) to secure the bank’s original charter, fulfilling starting capital requirements, and securing the Commerce Street site that has housed the bank’s headquarters ever since. Carter’s other foundational move was to hire Conville Lemoine from another local bank, to join the BSF team. The men have worked shoulder to shoulder ever since. Carter has served as President and CEO from the bank’s inception, and as Chairman since 2004. But as a banker his experience goes deeper. Born and raised in Baton Rouge and educated at LSU, Carter began his banking career in 1970 in the capital city as a commercial lender, going on to attend the School of Banking of the South, Senior Bank Officers School conducted by Harvard University, and the Sheshunoff Executive Banking Institute, among others. 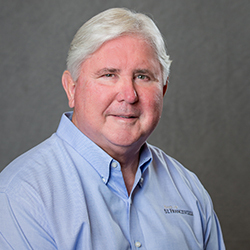 When you’ve been with a bank as long as Carter has, the institution’s relationships are your relationships, and many of BSF’s deepest ties with area businesses and other financial institutions result from the close connections he and Conville have forged over the years. Carter is a graduate of Leadership Greater Baton Rouge and Leadership Louisiana, and served two four-year terms on the Board of Directors of the Louisiana Bankers Association, including that of Chairman in 2006. In 2016 he is transitioning day-to-day operations to his son, Carter Leak IV, who joined the bank as Executive Vice President in 2014, but continues to advise lending, marketing, and business development activities, and guides the bank’s long-term strategic initiatives. In West Feliciana Parish, Carter’s influence is palpable, beginning with the bank headquarters itself, rebuilt in 2008 on the site of the original building. Committed to giving the parish a Louisiana vernacular structure worthy of its architectural heritage, Carter communicated his design concept to the architectural firm by sending a copy of the book The Louisiana Houses of A. Hays Town, (1999, LSU Press), telling the architect, “If it’s not in here, don’t think about it.” Warm, comfortable and welcoming, the handsome resulting building stands on Commerce Street, holding pride of place at the gateway to St. Francisville’s historic district. In 1996 Carter co-founded Feliciana Vision, a community-wide strategic planning initiative. He is a founder of the West Feliciana Community Development Foundation, served as its chairman from 1998-2000, and was selected Volunteer Economic Developer of the Year in 2000 by the Southern Economic Development Commission. He served on the West Feliciana Planning and Zoning Commission since its inception in 1983 until 2005, and is a co-founder and charter member of both the West Feliciana Chamber of Commerce and the Rotary Club of St Francisville. When not at the bank, Carter enjoys traveling, spending time with family and friends at the beach, messing about in boats; and especially, following the activities of his twelve grandchildren.